For over 250 years Hunt’s Mills has served many purposes. It is probably one of the more historically significant sites in East Providences. In fact this property is home to the East Providence Historical Society. The historical society is at the John Hunt House which is one of the oldest houses in the city. The house was built in the mid 1700’s. This site also has been home to several mills over time dating back to the mid 1600’s including a sawmill and a grist mill. In the late 1800’s a local private company (Rumford Chemical Works) set up a water company here to supply their mills and factories with water. In the mid 1920’s the town would take over the water company, along with the Turner Reservoir, to supply the growing town with water until the town starting receiving its water from the Scituate Reservoir. At the turn of the century there was an amusement park here to help offset the cost of running the water company. And lastly, the fire department used this property as a training grounds for several years. The hike starts near the small parking area by the gazebo just to the right of the Hunt House. The red blazed trail first leads down a small set of stone stairs then winds through an area known as the Terrace Garden. At different times of year there will be different shrubs and flowers in bloom here including mountain laurel. The red blazed trail then turns right into a short section of woods before crossing an access road. The trail then continues straight in the woods meandering slightly downhill toward the Ten Mile River. At the next trail blaze post, the red blazed trail turns to the left. Here on the right is a spot known as Sunset Rock. It tends to be a little overgrown in the summer months, but it offers a good view of the river the rest of the year. Continuing following the red blazed trail will lead you to the next set of trail blaze posts. Again at the rivers edge is another spot to view the river. This spot is known as Otter Rock as there have been sightings of otters at this point. When the water levels are low on the river you will find inscriptions from the early 1900’s on the rocks. The red blazed trail then leads south passing a chain link fence into the former fire department training area. You will soon see the remnants of the facility including the old fire tower that was used for training and an old tanker. The trail then passes the chain link fence again to the next trail blaze post. Turning right here will lead you to the large grass area behind the Hunt House. In this area behind the house there is a circle of granite blocks. These blocks represent where the carousel of the amusement park once stood.You then walk toward the gate between the house and the large stone building that was once the pump house (built in 1893) for the water department to the final highlight of the hike. The Hunts Mills Dam and waterfall. From here you then follow the road in front of the Hunt House to the point of beginning. This hike makes a nice companion to the Turner Reservoir hike. Willett Pond is in the Riverside section of East Providence. It is a nice little spot wedged in an suburban area. 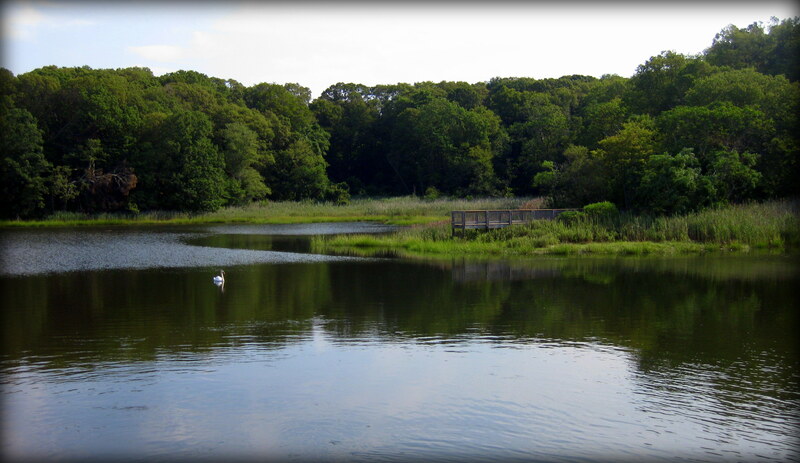 In the 1870’s a dam was built at the Mosskettuash Brook to create Willett Pond. Its original purpose was to harvest ice for the growing resorts in Riverside. In later years the resorts closed and residential neighborhoods were built in the area. The ice harvesting ceased and the pond was used primarily for recreation. Today the pond is stocked with trout in early spring and is used for fishing in the spring and summer. There is also a boat launch here for kayaks and canoes. A short half mile trail loops the lower half of the pond. The trail, blazed orange, begins at a parking area between a small shopping strip and the pond itself. The trail then follows the edge of the pond behind a residential area before turning to the left and crossing the water on a small wooden bridge. The trail then curves to left again following the shore of the pond. The trail at some points comes out into grass areas of what seems to be backyards of the abutting properties and then back into the wooded areas again. The trail then comes out to the grass area along Willett Avenue. From here you can walk pass the small spillway and back to the parking area. Swans are common sight and tend to nest here. Please do not disturb them. Otters have also been seen here in the winter months. 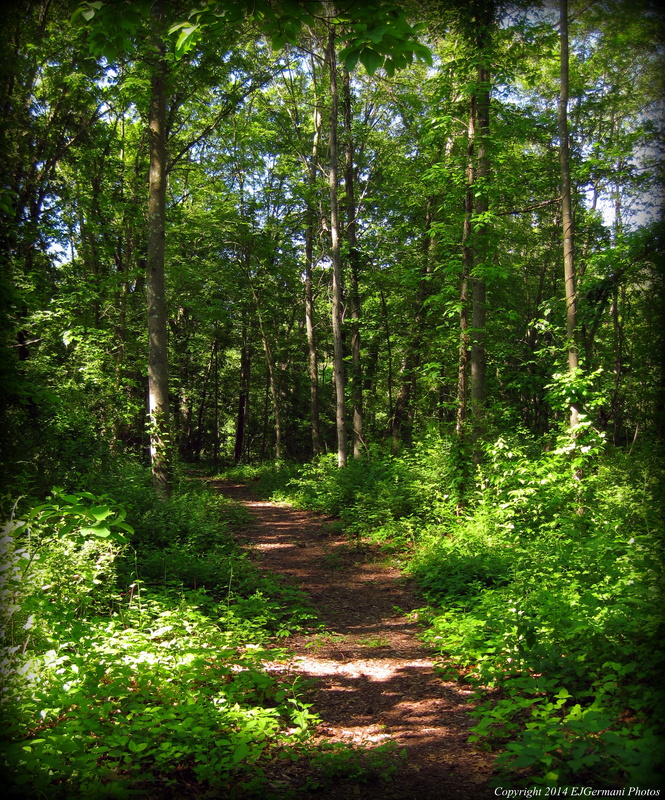 Trail map can be found at: Willett Pond. 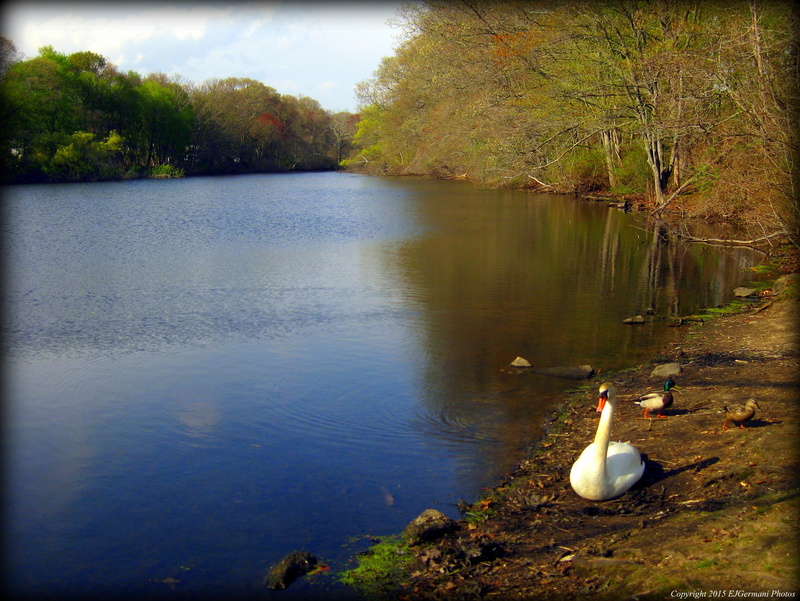 Boyden Heights is an East Providence Conservation Commission property that overlooks a cove and the Providence River. The trailhead starts at a small parking area on Boyden Boulevard. There is a red blazed loop trail, a blue blazed “lollipop” loop trail, as well as a few spurs that lead to the bike path on the property. It is small enough that you will not get lost if you choose to explore the entire property. One of the highlights of Boyden Heights is the dock that reaches out into the cove. Swans, ducks, and several other species of birds, including orioles, yellow finches, and woodpeckers are commonly seen here. Across the cove, the clubhouse of the Squantum Association is the most predominant structure. It was built in 1900 replacing the 1873 structure. This building is used for weddings and receptions. President Arthur and President Taft have attended events here. The property also abuts the East Bay Bike Path, if you wanted a walk of more distance you could follow the bike path south to the Ponham Rocks Lighthouse or to the north toward Watchemoket Cove. Trail map at: Boyden Heights. The Turner Reservoir was flooded in the 1930’s and supplied drinking water to the residents of East Providence for several years. Today the reservoir is used for passive recreation. There is also a 2.7 mile loop around the reservoir and Ten Mile River that is mostly a wooded trail, but includes boardwalks and some road walking. There is a parking lot along Pleasant Street opposite Hunts Mills that has an informational board about the trail and its surroundings. Following the dirt trail along the west side of the Ten Mile River you will soon come to a grassy area near the Turner Dam. Continue to follow the grassy shore of the reservoir to a trail the leads into the woods. This section of trail is rather narrow as it follows the shore of the reservoir behind a residential neighborhood before coming to Newman Avenue. Here you turn right (being aware of traffic) and cross the causeway between the Turner Reservoir and Central Pond. Here you cross into Seekonk and then right onto Arcade Avenue. Just north of utility pole 1416 a blue blazed trail into the woods appears. This long stretch of trail follows the shores of the reservoir once again passing behind the Seekonk High School. Along the way there is a side trail that dead ends onto a peninsula that has sweeping views of the reservoir. The wooded trail ends back at the earthen dam where there are some more sweeping views of the reservoir. From here, walk down the hill and the loop continues along a series of boardwalks that wind through the wetlands along the river. The trail then ends at another parking area along Pleasant Street. Turn right and cross the bridge over the Ten Mile River to reach the first parking area. Trail map can be found at: Turner Reservoir.